몬테비데오에서 여행하기 편리한 호텔을 찾고 계신다면 Hotel Tres Cruces 만큼 좋은 곳이 없습니다. 이곳에서 생생한 도시의 모든것을 쉽게 즐기실 수 있습니다. 또한 병원 브리타니코, 에스타디오 센테나리오, 무세오 델 풋볼에 가기도 편리합니다. Hotel Tres Cruces의 모든 노력이 손님의 기분을 편한하게 만들기 위해 호텔은 최고의 서비스와 시설을 제공합니다. 전 객실 무료 와이파이, 24시간 프런트 데스크, 여행 가방 보관, 주차장, 엘리베이터 같은 최상급의 시설을 호텔에서 즐기실 수 있습니다. 품격 있는 객실 시설을 경험할 수 있으며, 일부 객실에 구비되어 있는 에어컨, 모닝콜 서비스, 전화기, TV, 위성 방송/케이블 방송 또한 재충전의 시간에 도움이 됩니다. 호텔에서 지내는 동안 레크레이션 시설 등 풍부한 시설을 이용하실 수 있습니다. Hotel Tres Cruces의 전문적인 서비스와 다양한 특징의 매력적인 조합을 발견하실 수 있습니다. The Tres Cruces Hotel is one short block away from the main bus station. This is convenient as the bus from the airport arrives at this station, and buses to places like Colonia also leave from here. City buses to the downtown historic area leave from here also. The breakfast was served from 7-10 a.m. The staff helped with itinerary suggestions and directions. Highly recommend. Location is good when a rest is needed before hopping on another bus. Breakfast excellent. And staff very friendly. I recommend this hotel. Unpretentious but for those of us on a budget, a good choice. good cheap hotel. nice view from room. close to bus station were the local bus goes to citycenter in 15 min.good buffet breakfast with fruit. 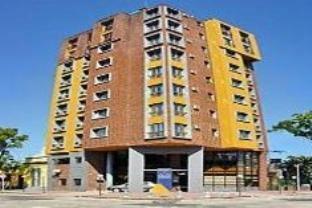 I can recommend this hotel because it's cheap and good, also location is verygood, only a few steps from downtown Montevideo. hotel bien place, personnels aimable, tres bien pour le prix. Cet hôtel économique est situé près de la station de bus et du centre commercial Tres Cruces. Les chambres sont petites et le petit déjeuner est assez copieux. Preiswert , zentrale Lage zu Geschäften und öffentlichen Verkehrsmitteln und dem zentralen Busbahnhof mit Verbindung in fast alle südamerikanischen Länder ; kostenlose Garagenunterbringung des Mietwagens . Entfernung zum Stadt-Zentrum zu gross (ca. 6 km); Verständigungsschwierigkeiten ,da kein Englisch im Hotel gesprochen wird. Das hauseigene Cafe ist leider nur am nachmittag für 2 Stunden geöffnet. Freundliche Aufnahme bei der Anreise ; Zimmer war sauber, die Reinigung wurde aber 2 x während des Aufenthaltes vergessen.Frühstücksbuffet gut und reichhaltig. Grosse Hilfsbereitschaft beim Personal ,jedoch ,wenn man kein Spanisch spricht , treten Verständigungsprobleme auf, da keiner der Angestellten der englischen Sprache mächtig ist. Auf Wunsch erhält man einen kostenlosen Garagen-Voucher, um ein Mietfahrzeug bewacht unterstellen zu können.PC mit guter Internet-Verbindung ist vorhanden und kann jederzeit kostenlos genutzt werden. Hotelucho de 2 estrellas, no mas. Esta como a unas 5 cuadras de la terminal de buses, en un barrio feo. Tuvimos que hacer el check out a las 5:45 para tomar el bus, y las calles oscuras estaban de miedo. Un hotel caro para la zona,su fealdad y lo poco que ofrece. Su unica cualidad es estar cerca de la terminal. La relación precio / beneficios de este Hotel es la mejor de Montevideo. La ubicación es excelente y esta cerca del shopping tres cruces, que tiene muchas opciones de compra y servicios. También esta cerca del centro. La atención de empleados es muy buena. Es la primera vez que voy y me ha gustado mucho. Ya reserve para el domingo 23 de mayo. Um hotel que prima pela limpeza. Um ótimo café da manhã. Um ótimo atendimento (recepção) Bem localizado, próximo à rodoviária Boa acomodação (apartamentos espaçosos) Um bom preço. Não tenho restrição alguma e indico este hotel a quem viajar para Montevideo e queira hospear-se num hotel de preços módicos e de boa comodidade. Um hotel simples mas aconchegante. Não tenho restrição alguma e indico este hotel a quem viajar para Montevideo e queira hospear-se num hotel de preços módicos e de boa comodidade. Um hotel que prima pela limpeza. Um ótimo café da manhã. Um ótimo atendimento (recepção) Bem localizado, próximo à rodoviária Boa acomodação (apartamentos espaçosos) Um bom preço.